Bangalore-based Achindra Online Marketing Pvt Ltd, which runs the food ordering website JustEat.in, has signed up 400 restaurants in its latest market - New Delhi and NCR, where it launched in April. A quick comparison with Zomato.com, an online restaurant listings and menu-pages site, shows it has a long way to go yet. The Gurgaon-based Zomato has signed up with 4,500 restaurants in New Delhi- NCR. In Mumbai and Bangalore it has signed on 4,900 and 2,000 restaurants respectively and has some 16,800 restaurants pan-India. JustEat.in services three cities in India - Bangalore, Mumbai and New Delhi, NCR and has signed on a total of 750 restaurants. It also offers restaurant listings and reviews for other cities such as Bhopal, Kolkata, Chandigarh, Goa, Indore, Hyderabad and Jaipur. "Delhi is a foodies heaven and Delhiites love to dine out and try new food. However traffic and traveling time is a challenge and hence increasingly large number of people prefer to get home deliveries done instead of traveling to a restaurant," says Ritesh Dwivedy, CEO, JustEat.in. He adds that home delivery of food and takeaways are becoming increasingly popular in metros where double income families faced with long working hours. The rise of Quick Service Restaurants (QSR) format is also aiding in the growth of food-related websites. JustEat has implemented technology to help restaurants react faster to online orders. 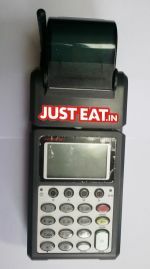 The JustEat Connect Terminal is a GPRS-based device installed at restaurants which is integrated with JustEat's systems. Orders placed on the website are automatically routed to the restaurant using this device. The company is also investing in online ads and social media marketing to grow its user base.